Roasted potatoes, onions, sausage and peppers roast in the oven with a drizzle of extra virgin olive oil and rosemary. Don’t you love a meal that only dirties one pan? This is an easy one-dish meal that makes clean-up a breeze, and the smell in your kitchen will make everyone hungry! Anytime I find a great alternative to fatty Italian pork sausage, I’m all over it! I have nothing against pork, I just wish they would make leaner pork sausage. 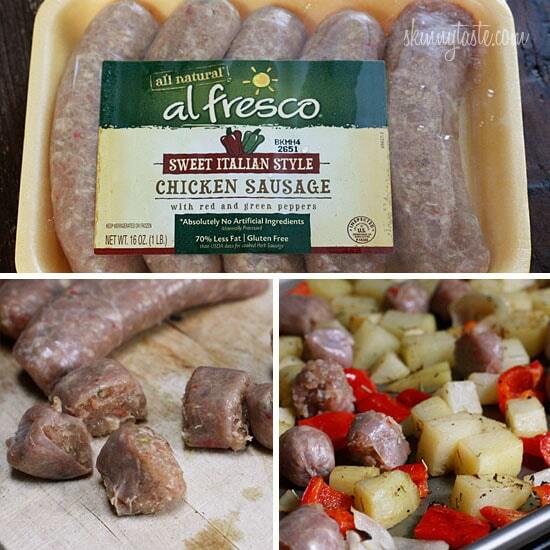 I’m pretty picky about my Italian sausage, but I loved al fresco’s sweet Italian chicken sausage, I almost forgot it was chicken while I was eating and it’s 75% less fat that pork sausage, and it’s gluten-free, so that’s a plus! This is a really easy dish to make, the main thing is cutting everything about the same size and don’t crowd the pan. The potatoes take the longest to cook, so if you cut them small it all evens out. The onions get a little charred which I love, if you want to avoid that you can add them with the sausage. I’ve even made this with Turkey Kielbasa and it turns out cheap, simple and great. 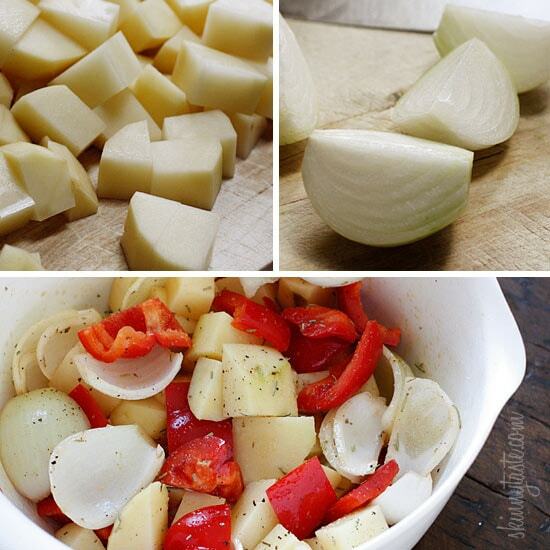 Try it with red potatoes, new potatoes or russet. 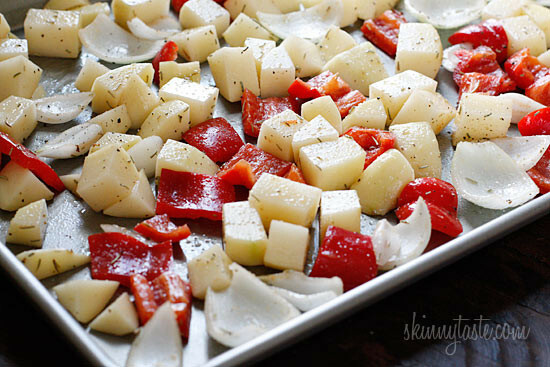 Spray one large non-stick baking sheet, or two small ones with olive oil spray to prevent the potatoes from sticking. Add the sausage to the baking sheet with the potatoes and vegetables and bake, tossing once or twice for 25-35 minutes, or until your potatoes are cooked through. Cooking time will vary depending on the thickness of your potatoes and sausage, keep an eye so they don’t burn. Amazing! Used Gianelli sweet Italian chicken sausage and it was delicious. Thank you for a great recipe! This is one of my go-to meals. My husband loves it, and it’s super easy for days I am worn out at the end of the workday. Every recipe I’ve tried of yours is amazing, but this is probably one of my favorites. I often add either a salad or add a green veggie to the roasting pan. Made exactly as listed, and it was ok. Easy prep and clean up. Potatoes steamed and did not brown on my non stick half sheet pan. I will start them alone next time, then add the rest later. I may add a little more/different spice to jazz it up a bit. It probably will be great with eggs tomorrow morning! This is the perfect clean-out-your fridge recipe. I vary it a lot depending on what I have on hand. We like regular and sweet potatoes, broccoli, asparagus, carrots, mushrooms, peppers, literally whatever I have on hand. Cherry tomatoes are great to throw on top the last few minutes in the oven if you happen to have some. Thanks for the basic recipe. It serves our home well! 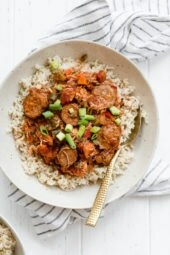 If I used Italian Pork sausage how would the points change? I substituted butternut squash for the potatoes and it was delicious! We love, love, love this meal in our house! It’s soooo easy and satisfying. It’s easy to modify to your tastes (sausage flavor, veggies, spices) that you can easily change it up for variety. It’s excellent the next day as part of a frittata or an omelette! This was delicious and super easy to make. Added some carrots as well. Cant wait to eat it again this week. I was wondering if you’ve tried this in your instant pot yet? I make it very often but just got an IP. I haven’t yet, let me know if you do! I love this recipe! It’s so easy and my husband loves it! This recipe is a go to meal for my husband and myself when I’m working late… it’s a quick easy prep and is so tasty! Love all your recipes! I made this today. It came out delicious! I enjoyed it! Wow! Total hit with my family and so easy to prep and cook! Thank you. I used chicken bratwurst and red potatoes. My son wants me to go heavy on the onions and to add mushrooms next time. Instead of peppers, try asparagus and mushrooms. It’s devine! This is a regular part of our dinner rotation – I love that i can prep the meat and veggies and keep in the fridge so my husband can stick in the oven when he gets home. 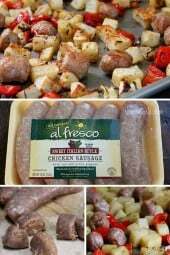 We make this with apple-chicken sausage and it’s SOOO good! Thanks, Gina! Really looking forward to trying this tonight! I was bummed that the Al Fresco sausages at my store only came in 12 oz. packs, nothing bigger. I bought 2, cringed at the cost just a little, but I know it’ll make for a good dinner that can last me all week. 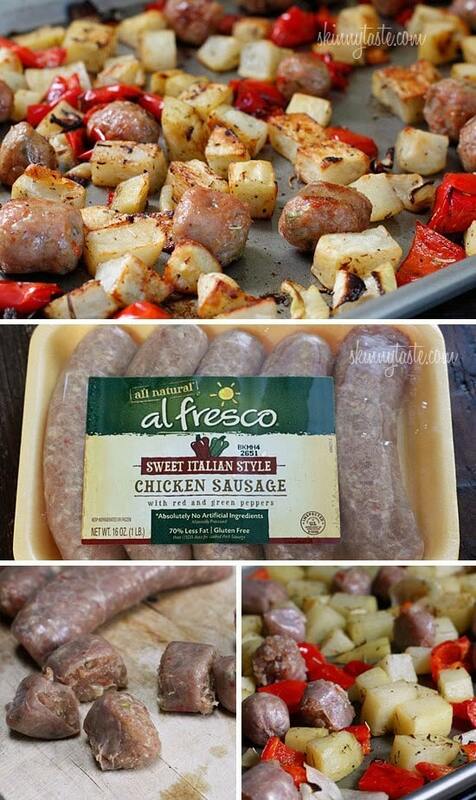 I ended up getting the Asiago & Red Pepper chicken sausage (didn’t have the Italian flavor)- plus red potatoes, onions, peppers and I might throw in some mushrooms that I have on hand. Not sure what I’ll eat this with yet but I’m already looking forward to dinner. Started Weight Watchers for the 2nd time, yesterday, and I’m so thrilled to have your recipes as a resource!! I’m making this for the 2nd time this week, it’s so good! I subbed Aidell’s Chicken Apple Sausages, sweet potatoes and sweet onions in the recipe and it’s awesome. I’m doing Whole30 and this is probably my favorite meal I’ve made so far. I eat it with either avocado or an over easy egg on top. You can measure the whole recipe in cups then divide. Thanks! Having it tonight with a salad. Great recipe! We use the leftovers in our eggs the next morning! Delicious! Made this tonight, & it was yummy! So yummy! Made it with tomato basil chicken sausage and it was super good! So excited to try this! One question: if I'm not going to include potatoes (doing low carb) would the cooking times change for both parts? I was going to cook onion/green beans and then add the chicken sausage. Thanks! The bulk of the cooking time is for the potatoes, so the cooking time would change quite a bit. I would cut the time in 1/2 and there wouldn't be two parts. Just put sausage with the onions, spices and oil. You'll need a less spices when you remove the potatoes. Put the green beans in for the last 20 minutes or so. I used my Palermo Spiralizer for the potato and onion, and I used Hot and Spicy Chicken Sausage, instead of mild. It was a HUGE hit with my husband and my 8 year old son! SO YUMMY! 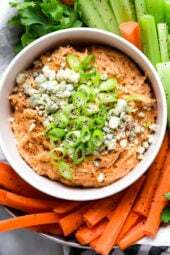 another great recipe- thank you for all your delicious recipes – I have lost 20 lbs since the Spring and a lot is contributed to your meals – I am eating the right portions and everything I have made is very flavorful and satisfying. I have no idea why but when I first made this recipe it came out perfectly but the 2nd time I tried it it didn't go so well. My potatoes burned a bit and they stuck to the baking sheet even though I used the non stick spray. I'm guessing it may vary depending on oven as I know some ovens can cook faster than others at the same temperature. But either way the recipe was amazing I loved it and it was so good too thank you for sharing with us. I made this tonight with 1 red and 1 yellow pepper and 1 1/2 onions because I love onions! I also had the same Al Fresco sausages but the sweet apple onions. Was really yummy! I know it says 1/4 of the recipe as a serving size but if you were to measure it, what would be the serving size? Thanks! Made this for dinner tonight. I unfortunately do not have an operating oven so I made it in my large saute pan on top of the stove and it still turned out lovely. Definitely will be making this again! So good!!! Used Thin n' Trim All Natural Wildfire Buffalo Chicken Sausage and red potatoes. Love all Gina's recipes! Gina, I made this last night for the first time. I bought the Simply Balanced chicken sausage at Target. It was fantastic! Even my picky 3 1/2 year old son loved it. I used a mix of red and green peppers (since it was what I had at home), Eastern potatoes (again what I had!) and everything was just delicious! It was so filling and I had leftovers! Just curious if you could tell me roughly how much a 1/4 of a serving is? I was going to try to measure it out in cups but forgot to before I served everyone. Thank you for your wonderful recipes! Keep 'em coming! Can't wait to try this! How do you think it would be with sweet potatoes? This looks great and I look forward to making it. Did you eat this alone or did you serve it with something else? I made this Wednesday night and my 9 yr old loved it, we had it for leftovers last night and it was even tastier. I didn't have any rosemary so I subbed a little dried oregano on the veggies, followed the rest of the recipe exactly and it was delicious! This is a keeper! I am abominable at cooking but even I was able to make this and it was delicious! I didn't have rosemary and I made it in a toaster oven and I used regular sausage and I'm making it again tomorrow! Smells so good! Made this again last night, so delicious! Tweaked it a little bit since it was just me and my husband and it is just soooooo good! 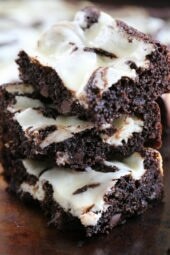 Making this right now, the kids came to hang around the kitchen because the contents smelled so good while mixing them! This was delicious. I never thought I would like rosemary before, but I was wrong. Thanks again, Gina, for another wonderful recipe! I made this the other day; used turkey sausage instead of the chicken one. It was delicious! I made this last night and it was delicious. I tend to always use turkey sausage in recipes, but I branched out and tried the chicken. It was great! Made with vegan sausage and served over polenta. Even my meat-eating family loved it! This was good; the whole family enjoyed it! Great recipe, easy to make. Thanks! I've had this bookmarked for a while and finally got to test it out today. It's such a low maintenance meal and packs a whole lot of flavor. The chicken sausage was much easier to cut after throwing it in the freezer for 15 minutes while I chopped the veggies, then while the veggies cooked it had a chance to thaw out. I will definitely be making this again – thanks for the recipe! I made this tonight with local turkey sausage and LOVED it!!! So good, easy, and only dirtied up the baking pan. Delicious too. Want to try adding some fresh garlic and smoked paprika next time. If you use a zip-top bag to coat the veggies with the oil and seasoning then it truly is a one-dish meal! This was fantastic! I used 1/2 russet and 1/2 sweet potatoes. The roasted onions were my favorite part! Thanks! Wow. I made this for lunch today, using Turkey Kielbasa in place of the chicken (had some opened that I had to use up). It was delicious! Hubby and I added 2 tbsp ketchup (well, he added 3) to our bowls and stirred it in to make a delicious skinny hash. Hubby was over the moon. I think this is his new favorite dish. I make this all the time, last night I changed it up a bit…I did in on the grill(lined with some foil), I also added zucchini and mushrooms. I spiced it with paprika, garlic powder, garam marsala and some cumin..Amazing!, Eating left overs at lunch as we speak :)…Thanks for all your recipes Gina! You give me the courage to tweak and change recipes to my liking! My whole family loved it. I used mild Italian sausage instead for a bit more of kick. Success!!!! I went "shopping" in a friend's garden today and included zucchini and mild banana pepper in the mix; otherwise I followed the recipe and it's fabulous! Paleo guests arriving this week and this is a perfect meal for them. Thanks Gina…your recipes are always keepers! Could you also make this with kielbasa or do you think it would change the points too much? i did not have sausage so i am using chicken cutlets.. I also put in Asparagus . Delicious! I don't care for peppers, so I didn't add those, but I used the simply potatoes red potatoes to save on time (I just chopped them smaller). I love your site, makes my WW life a bit easier. Oh the irony. I pulled some chicken sausage out of the freezer and then I thought "Roasted potatoes would taste great with this. Let me see if Gina has a recipe." I couldn't believe it. Can't wait to try this one! YUM! We had this tonight and it was very simple to make and very tasty. We ended up with Turkey sausage because I couldn't find chicken sausage. It is definitely a keeper. I like Al Fresco sausages, but LOVE the Bilinski ones if you can find them. I am a fairly new WW and was told about your site. I have enjoyed reading your recipes and made this recipe tonight for dinner. It was delicious. Both my husband and I are trying to eat healthier and stay on program and what a way to do that. This is definitely a repeat dinner for us and we are anxious to try lots more of your recipes. Thanks. Made this for dinner, added a little thyme and threw an over-easy egg on top. Yum, thanks Gina! This was an awesome dinner we had last week. Thanks so much for your great recipes!! made this today with Johnsonville cooked chicken sausage, its got about 30 cals more per link and i think double the fat but somehow it only came out to be 6 points for 1/4th of it…. i also used fingerling potatoes and omitted the rosemary. i thought it was super tasty! I used turkey sausage because the store I stopped at didn't have chicken sausage.My whole family raved how good it was except using regular hot sausage because it is about impossible to find chicken sausage here .